Shaun in Japan: ☆お正月☆　New Year's! Yeah, that was unprofessional. Now let's get with the program. The last couple days, I've gotten to experience Japanese New Year's traditions. New Years is called "o-shougatsu" in Japanese. By the way, when I write "ou" when I'm transliterating Japanese, you pronounce it as a long "o" sound. The best way to type it would be to put a line over the "o" but, while my showing off above would suggest otherwise, I'm not really sure how to type that. You can also transliterate it as "oo" but I always want to read that sound as the "oo" in words like "gooey" instead, so I prefer the "ou." At least it makes you stop and think about how to pronounce it. Plus it mimics what you would type on a keyboard to write Japanese: お o しょう　shou が ga　つ tsu. There's also a distinction between おお oo and　おう ou, even though I think for the most part they're pronounced the same. For example, the city Osaka actually has a long "o" at the beginning but it's an "oo," not an "ou." Of course, we decide to throw the whole program out the window and make no distinctions about long and short sounds when we're writing Japanese place names and stuff in English. Tokyo also has long "o"s, of the "ou" variety. I hope you enjoyed your hopefully educational but completely uncalled for tangent of the day. Maybe I'll manage to stay on topic for the rest of the post. First of all, the other day I watched an incredibly, incredibly sad movie with my host sister Arisa. It's a Korean film that's called 私の頭の中の消しゴム, The Eraser in My Mind, in Japanese. According to Wikipedia, the Korean title translates to A Moment to Remember. I'm not sure how much to tell you that won't spoil it because when I watched it, 1) I didn't know the title and 2) Arisa just told me "It's a sad one, so we'll need tissues." It begins with a chance meeting between a company employee and a construction worker, and the story follows their romance and their life together, but the young woman suddenly begins to have problems with her memory. I recommend it, even though it was so sad, because the story seemed really sensitive and well-executed, and I liked the characters. I'm not sure if you can find it with English subtitles or not. I watched it in Korean with Japanese subtitles. I didn't understand every word, but I could read a lot more than I thought I could. At the same time, I think it says a lot about the power of the film-making that I could be so moved by a story that was not in my native language twice over. I can't remember which day we watched the movie. I'm pretty sure it was the 30th, because we started it at midnight and didn't finish until 2am, so then I slept until like 12:45 and then spent all of the 31st up until dinner time updating this blog. The 31st was New Year's Eve, so we had a big dinner together as a family (minus my host brother. Apparently he was out with his friend(s)). I ate way too much and ended up with a huge stomach ache in the middle of the night, thanks to the karaage. Sushi, tomato and cream cheese thing Arisa made, karaage and something like an egg roll, and cake! After we ate, we watched Kouhaku Uta Gassen. Kouhaku is a big singing competition that plays in NHK every New Year's Eve. I'm not sure how the competition part works, but it was fun to watch all of the over-the-top staging and dances and to see if I recognized the songs. They also had subtitles for all of the songs so when I did recognize one, I could sing along! It ended up being just me and Arisa watching because everyone else fell asleep, and she was really surprised when I occasionally recognized something. It was also a fun way to be exposed to a lot of the popular music from this year all at once. Kouhaku continued until just a little bit before midnight, to leave time for people to go visit their local temple/shrine (I'm not sure which because we didn't do this). We just stayed put. The noisy countdown didn't really seem to be a thing, which was a little disappointing to me. I did a little quiet cheer to myself and then went to go take the first shower of the new year and go to sleep. I ended up sleeping until like 12:30, so the next morning for brunch I ate zoni (soup with mochi chewy rice cakes in it) and osechi ryouri (special New Year's food) in my pajamas. I liked the zoni all right, but the rest of the osechi ryouri was really salty and therefore hard for me to eat first thing in the morning/afternoon. It's the first special food I've eaten in Japan that I've really not enjoyed. After my huge stomach ache from the night before, it was hard to get excited about more eating. We watched Enchanted, because apparently Missus really likes that movie. I can't remember the Japanese title, but it's some sort of literal translation of "enchanted," like "covered by magic" or something. The rest of the day was really uneventful and kind-of depressing for no particular reason. More of my yo-yo-ing Japanese confidence. But yesterday (1/2) was a lot of fun. I went shopping for a warmer coat near my house and just when I was about to get really frustrated and disappointed, Lynne emailed me back so I went to hang out with her and Eric. We ended up in Akihabara because I admitted I hadn't really explored there yet, and I happened to stumble upon a nice, warm, purple (!) winter coat on super-duper-new-years-sale. We were walking to a store Lynne wanted to go to when we happened to pass an Aoki suit store. On one of the racks in front of the store were winter coats for 1590 yen! And since they were outside, I could actually tell how warm the coat was when I tried it on. I'm really pleased with it. So far the only problem I've had is that it can be too warm! So it should serve me really well on my cultural practicum in cold, snowy Minakami. I also found a manga that I can actually read, and it's more entertaining than the short story anthology I was trying to read, plus it's easier to hold open on a train. It's called Silver Spoon, and it's by the author of Full Metal Alchemist. It's about this guy who goes to an agricultural high school. I'm not really sure why yet, though, since he doesn't seem to want to be a farmer. There's a really cute baby cow that will hopefully become a reoccurring character, too. After I got back from Akihabara, Arisa and I headed to a party at Tamaki-san's house. It was a lot of fun, as usual with that group. I met a lot of new people and I'm still not sure how they were all connected to each other. They were all loud and very enthusiastic. There was one older woman who kept asking me if I'd ever eaten all these different things she was trying to offer me. "Have you eaten mochi?" Err, yes, it was o-shougatsu the other day. Everyone ate mochi. "Have you eaten anko?" Yeah, okay, I have. Sam was totally sick of mochi, because while my host family just ate new year's food once and was done with it, apparently Tamaki-san's family has been going for the more traditional "eat osechi ryouri for days and days" approach, so Sam even had mochi for breakfast. Then his (apparently rather drunk) host dad comes up and is like "Want some age-mochi?" (Fried mochi) "Here, I'll go make everyone some!" So, Sam got another bowl of mochi set in front of him, much to his dismay and our laughter. We also played some sort of traditional card game for fabulous prizes (read: real money). I'm not sure what the game is called. Basically, there's a deck of cards with pictures and some sort of verse written on them, but we didn't use the verses at all in the game we were playing, just the pictures. Some cards had samurai (we called them futsuu normal or seifu safe... or occasionally "UGH THIS GUY AGAIN! "), some had monks (bozu), and some had princesses (hime). All the cards were stacked up in the middle of the table, and each person took turns drawing a card from the top of the deck. If you drew a samurai, you kept the card. If you drew a monk, you had to surrender your hand to the discard pile. If you drew a princess, you got to claim the first discarded hand on the table and you got to draw again. The goal was to get the biggest stack of cards by the time all the cards ran out. Since whether you kept or lost cards was pretty much up to chance, the game could change at any given moment. There where times when someone would have a huge hand, then draw a princess card, and then for their second draw, get a monk and have to give up everything they'd collected, which gave someone else the opportunity to take their big pile if they drew a princess. The one round that I won, I drew four princesses in a row, and everyone blamed it on Sam's bad shuffling, so as they went around the table, everyone kept saying "Bozu, Sam no sei," (Monk, Sam's fault!) and basically blaming whatever they drew on Sam. Sam's response was to insist that it was "Sam no keikaku," (Sam's plan). Too bad he didn't win that round. We were playing for otoshidama, which was real money (!) in cute envelopes. It started out that each envelope had 1000 yen in it and there were a lot of envelopes. Eventually we decided to raise the stakes by combining three envelopes into one and mixing that 3000 yen jackpot in with the rest of the envelopes. I guess we all really wanted money but got sick of playing the game because the stakes kept getting higher and higher so there were fewer, fatter otoshidama envelopes. My one win was in the 1000 yen stage and so was Arisa's, but Sam won 8000 yen over the course of several rounds. Home team advantage? One of the relatives ended up begging extra money off of Tamaki-san because she only won 1000 yen and then proudly announced her prize for ichiban kawaisou "most pitiable." It was a really entertaining party. I think today was the last of the New Year festivities. 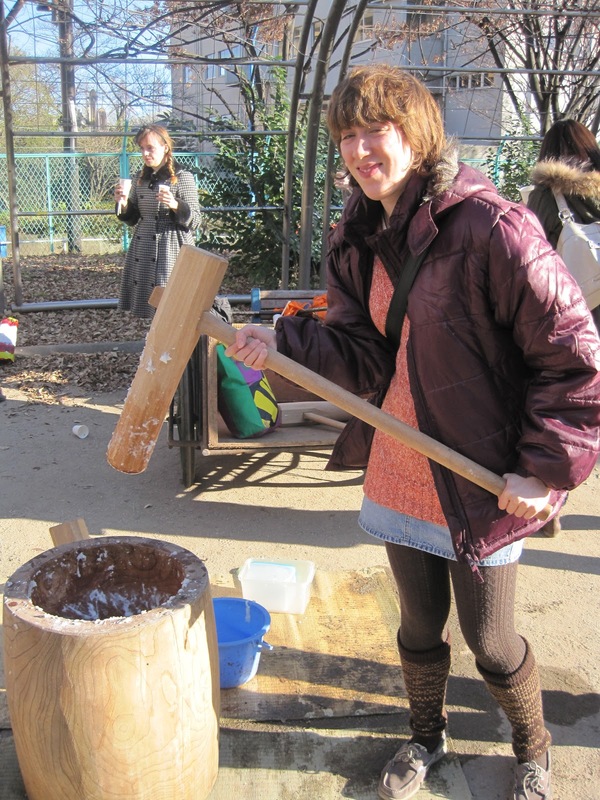 I went to a mochitsuki (mochi-making) event with one of the Waseda clubs, Niji no Kai. You make mochi by taking steamed rice and pounding it with a big wooden mallet until it gets soft and stretchy. Then we ate it with different kinds of toppings. My host family kept telling me that every year there's 119 calls (the Japanese 911) around New Year's from people choking on mochi, so I made sure to eat slow. I didn't actually get to try pounding the mochi because I wasn't assertive enough, but I did pose with the mallet afterwards. Man that thing was heavier than it looked! Akemashite omedetou 明けましておめでとう everyone! Congrats on a new year! Let's make it a great one! My resolutions are to 1) speak Japanese without fear and 2) make at least one Japanese language friend before I leave. Man, your family party sounds really fun! And the mochitsuki stuff looks a lot bigger than I would have thought it was. ....Now I really want to eat some mochi. I'm glad to hear things are going better. And it was fun to Skype with you last night. Get well soon! Great to catch up with you a bit Shaun. Keep on blogging! I took your 'suggestion'?! to read your blog to heart! :) Sounds like you are enjoying yourself more, which is great! and your new year's resolutions are wonderful....and very attainable. Wow! that first paragraph was something...I have no idea what you were talking about but I like seeing the Japanese word/pictures (can't remember what they are called! )Simple mind! It is exciting that you get to experience all these new holiday traditions. I'm off to read more!